Read more from Loryn Purvis, recipe creator, at Cooking & Cabernet. Combine milk, sugar, and salt in a medium saucepan over medium-low heat. In a large bowl, whisk the egg yolks until frothy and light yellow in color. When the milk mixture is barely beginning to simmer, remove from the heat and slowly add a little bit to the egg mixture, continually whisking to temper the eggs so they don’t scramble. Continue slowly pouring and whisking and then pour the ice cream base back into the saucepan. Heat over medium-low heat, stirring constantly, until the mixture thickens and coats the back of a spoon. Place the heavy cream in a large bowl that can easily be chilled over an ice bath. Strain the ice cream base into a fine mesh sieve, into the heavy cream. Whisk together, and slowly add the Tantillo Extra-Virgin Olive Oil. Cool entire mixture using an ice bath, stirring every few minutes until cool. Pour mixture into an airtight container and chill for at least two hours in the refrigerator. Church ice cream in an ice cream maker according to manufacture directions. Transfer to an airtight container and let set in the freezer for two hours before serving. 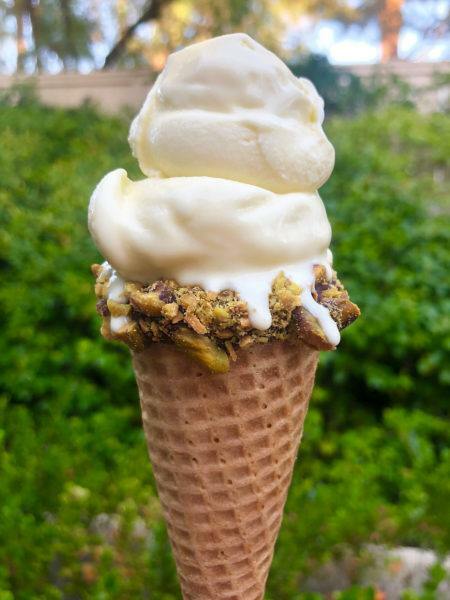 Enjoy in a chocolate dipping cone with pistachios, or with a small drizzle of Tantillo Balsamic Bliss over top.